After her class dismissal, Dot asked for permission to play at the playground. When I gave her the go-ahead, she dashed for the playground, together with a few of her classmates. Maybe that’s the best part of their school hours – free play at the playground. They chased one another around the playground, picked twigs and dried leaves and climbed the rocks, with little adults’ intervention. 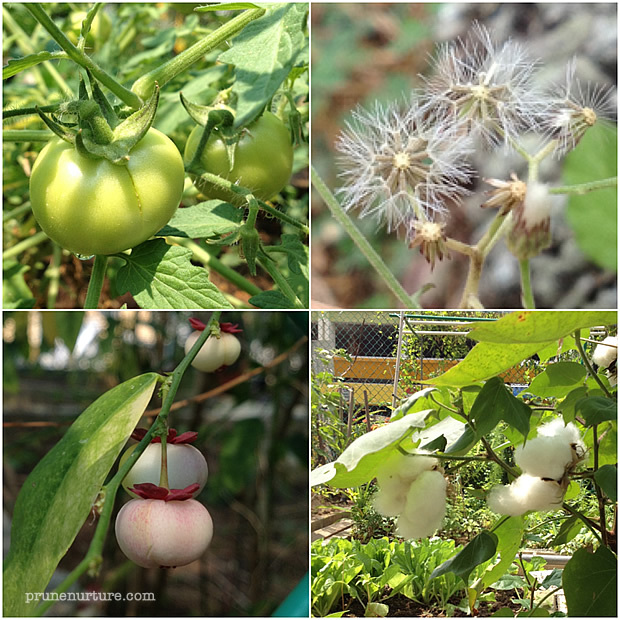 When the children bid one another farewell and went off, Dot and I continue our fun by exploring the community garden nearby, where we saw vegetables and plants like lettuce, cotton, tomatoes, flowers and more. As we walked towards Dot’s grandparents’ place, she ran on the green grasses, stopped and observed the grasses and the little insects, blew the winged seeds off the stalks and picked leaves and flowers. Suddenly, she spotted a blue little container, picked it up and proudly showed me her new find. 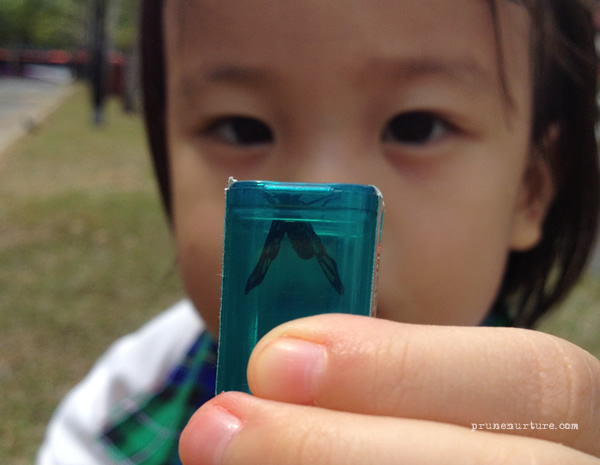 In the next moment, she showed me a little winged insect she caught with this little container. I was pleasantly surprised with her catch. After her afternoon nap, she watched the children program on the TV for a short while then Dot asked to go outdoor again to search for the butterflies. We were outdoor for almost an hour but Dot didn’t catch any butterfly. 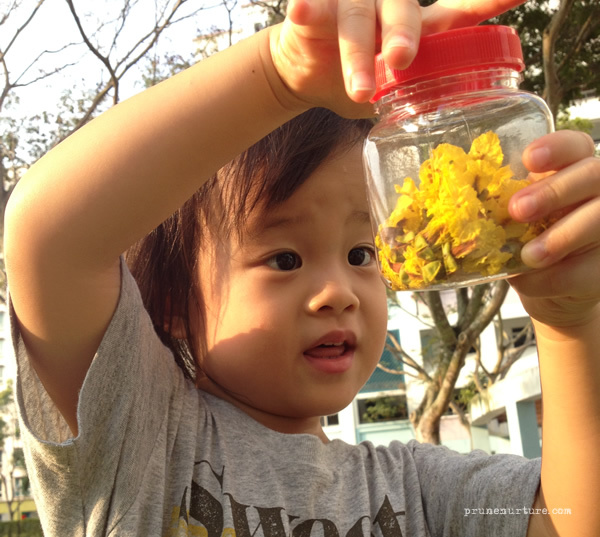 Instead, she filled the container that her grandma gave her with dried grasses, yellow flowers and even ants along the way. She played at the playground for a short while and then told me that she wanted to go and look for butterflies again. I was not very hopeful that she would catch any butterfly and we headed our way back to her grandma’s place. Along the way, we saw a bird’s nest hanging precariously on a branch. The sky was turning orange, I told Dot that we had to go back for dinner. Dot refused to go and still persisted in her search for her butterfly. As if by divine appointment, we spotted two little winged insects resting on the leaves of a plant. Dot started to chase the insects. One of them flew away and she tried to catch the other insect. She chased the insect for about 10 minutes before she caught it. All the while, I stood aside watching her chased the winged insect. I was very glad that she learnt to persevere and caught the winged insect on her own. What a great way to learn about patience and perseverance! After a few hours of captivity, the insect was released back to nature. Prunenurture partnered with Screensavers to promote the healthy use of digital technology for children. Learn more about the Screensavers guide here.